This entry was posted in Mental Health, Recovery & Support and tagged Co-Occurring Disorder, Depression, Managing Symptoms, Treatment on July 25, 2016 by Baxter Ekern. Contributed by The Camp Recovery Center clinical team member Kathryn Taylor, MA, LPC/MHSP. Everyone has bad times, and the recovery course from addiction is sure to bring some tough challenges that might put even the most determined of individuals into a down mood here and there. Alcoholism and depression are a common dual-diagnosis, and as one disorder is treated, the other usually gets better, too. No one goes into addiction treatment to feel bad, but to feel better. Treating addiction, in general, can ease depression. 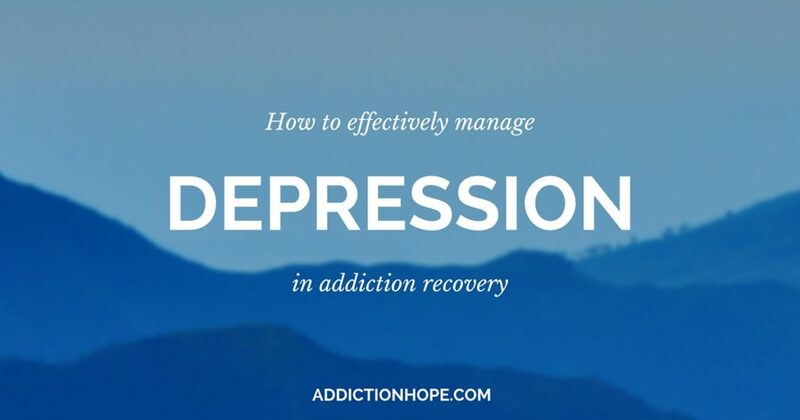 Discovering the effects of depression and distinguishing how to fight it will also encourage a more rapid recovery from addiction. It can be difficult for a depressed person to feel like completing addiction treatment with any success is possible. This is because depression causes negative thoughts and feelings of overwhelming hopelessness. There may be an emotional pain or feelings of emptiness that do not seem to ever go away, especially without the use of substances. In these times, it is practical to recognize that such feelings, as untrue as the thoughts that cause them may be, do cause real pain. The agony that is experienced while letting go of the effects of a substance is a very genuine emotional distress. It would be unrealistic to expect to be happy, even during socially celebrated occasions, while dealing with depression and the newfound absence of drugs and/or alcohol. As guilt is another component of depression that is magnified with addiction, a depressed person can feel guilty for the addiction and blame the depression on his or her previous personal decisions. Such guilty feelings can actually cause a person to feel unworthy of accepting necessary help, or to reason that the personality traits that led to his or her disorder are too deeply ingrained to change. Neither addiction nor depression is a personal decision. If a person could simply decide to feel better and stop abusing substances, no doubt he or she would have already done so. A good way to fight guilty feelings is to show them up with determined and responsible actions, such as sticking to commitments made during one’s treatment plan. Developing a system of honesty is a major attack on guilt – and also a major change from the symptoms of a life lived in addiction. Even when it means fessing up to negative actions, speaking the truth in the home and to one’s treatment providers will send feelings of guilt away. Depressed feelings should be shared with addiction counselors. Treatment for addiction will include therapy that should teach a person to become mentally and emotionally stable enough to cope with life’s anxieties and disappointments without relapse. Some depressed persons will be prescribed medications to manage the disorder. Such medications do not need to become replacement addictions. Keeping clear communication with the prescribing doctor regarding one’s symptoms and use will be a safeguard against addiction to depression medications. Medications do not replace psychotherapy, however, so a dual-plan is most successful. A depressed person must be willing to be patient enough to find what works in the way of medical treatment. In the meantime, not enough can be said about taking the reins on depression, even in the home. Write a list of all of the substance-free activities that you sometimes enjoy. Choose one of these activities to do every day. Write and talk about what you enjoy. Do not expect to enjoy it fully at first. Joy will increase with repetition. Sleeping and exercise habits have much to do with depression, as do eating patterns. Eating and sleeping at regular times daily and getting a nutritious diet are great self-care practices that will benefit any recovering individual. Simply making others aware of the depression is a practical step to getting a little understanding from others. Making regular efforts to relax emotionally while performing mentally or physically active tasks, such as household chores or listening actively to another person, are great steps to stop bouts of negative thinking. Addiction and depression are treatable conditions. There is no need to let them dominate your life. If you have concerns about your own alcohol use and/or emotional well-being, please consider seeking treatment today. To learn how to effectively manage anxiety while in addiction recovery, click here. Do you or a loved one participate in healthy exercise to promote healthier well-being? What types of exercise do you find most beneficial and rewarding? Please add your input in the comment section below. “Effectively Managing Depression In Drug Addiction Recovery” was written by The Camp Recovery Center (Scotts Valley, California) clinical team member Kathryn Taylor, MA, LPC/MHSP. Kathryn has several years of experience working in dual diagnosis addiction treatment, women’s issues and trauma treatment as a licensed mental health counselor. : Treatment Improvement Protocol (TIP) Series, No. 48. Center for Substance Abuse Treatment. Rockville (MD): Substance Abuse and Mental Health Services Administration (US); 2008. Retrieved online 04/09/16 at http://www.ncbi.nlm.nih.gov/books/NBK64060/. : “Alcohol’s damaging effects on the brain.” National Institute on Alcohol Abuse and Alcoholism. Retrieved April 11, 2016 at http://pubs.niaaa.nih.gov/publications/aa63/aa63.htm. : “Depression Definition.” National Institute of Mental Health. Retrieved April 11, 2016 at https://www.nimh.nih.gov/health/topics/depression/index.shtml. : “Depression: What You Need To Know.” National Institutes of Mental Health. Retrieved April 11, 2016 at http://www.nimh.nih.gov/health/publications/depression-what-you-need-to-know-12-2015/index.shtml.